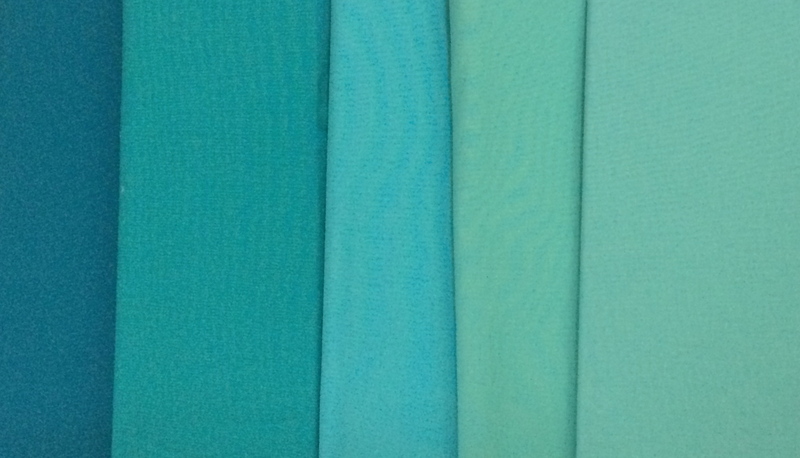 Are you confused when people talk about aqua, teal, jade, turquoise, topaz or cyan?? This is one of my favorite color ranges at the moment. Cyan is actually one of three of the secondary colors in the RGB color models. All these colors can be considered a tint or shade of Cyan. I thought the shades were well represented in this wikipedia page. I decided to take a pull of my Kona Solids and my prints to show you all, as a base. Here are some prints in my stash that fall in this range. I have so many more prints I could share, but I limited myself to 10 minutes 😉 Linking up with Molli Sparkles for Sunday Stash (see button on the right). This entry was posted in Uncategorized and tagged aqua, cyan, Kona cottons, sunday stash, Teal, topaz, turquoise on August 12, 2014 by mlwilkie. I just kinda call this whole range teal/aqua. I’ve been so into it for the past year or two! I buy a lot of them…but don’t use much of it! Hoping to make a big grey-teal quilt later this year. What a beautiful range of prints. I sometimes have a hard time using a range like that in a scrappy quilt; I’ll keep the colours and/or values really close together. Yah, I know, even though it’s scrappy.